Crossing the wash on 525, all dry! Spring is a tricky time of year for RVers. When I arrived in Sedona two weeks ago it was to escape 90 degree heat in southern AZ, and Sedona was getting up to 80. After the rain came through temperatures dropped and 70 was the average high. Tomorrow night, another cold front comes through. Flagstaff and other parts of northern Arizona are going to get snow, the low is going to be in the 30’s even here. This is the nature of spring, when you look at averages it’s a gradual warm up. But on a day to day basis it’s more like a random flip of the coin: heads you get summer weather, tails you get winter. This is a problem, as I’m at the 14 day boondocking limit today and need to move on. Generally I need to go north, but camping in the snow does not appeal to me. I end up on Thousand Trails road off of 260 east of Cottonwood, a short drive from my Sedona camp. It’s a busy area and doesn’t have the red rock views of 525, but it’s close to I17 so that when the weather warms back up I have a straight shot north. The mountain view to the southwest is pretty nice from my office window in the morning, don’t you think? By noon, the wind is picking up. Sustained winds of 25-35 mph are expected with gusts over 50 mph possible. That’s not strong enough to pose a threat to the Casita, but it’s not exactly fun to sit through either. I pack up my mobile office and move to the Cottonwood Public Library for the afternoon. I come home to discover the wind has pulled my wheel covers off the wheels – not a huge deal as the straps keep them from completely blowing away – but moving the covers has also dislodged the wheel chocks which is a first. It’s a good thing I’m on level ground! As the sun sets, blowing dust and dark clouds completely obscure the landscape to the west, it’s like Cottonwood has ceased to exist. I peek at my weather map, the rain is coming, and the winds are at their peak. Time to bring in my solar panel. 35 mph winds are strong enough to blow my portable solar panel over without some way to anchor it down. In many cases I’d have pulled the panel in long before, but because the wind was coming from the South today I was able to leave it out. The panel was facing south with the struts behind it to hold it up. It’s when the wind comes from behind it (north) that it can catch the panel like a sail and tip it over. The rain starts after dark and the wind slowly fades. The temperature drops. After a cold and dreary day yesterday (but not cold enough for snow – success!) it’s good to see the sun this morning. I’m up bright and early, gathering things together for an outing. 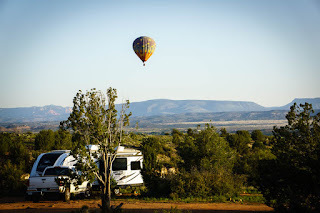 I count four hot air balloons on the way to Sedona. Balloon tours are a thing around here and I see them out most mornings. Today I get to watch them land as I take 260 west to Cottonwood and then 89A north to Sedona. I meet up with fellow full-timer Brian who is still camped along 525 and we carpool to Sugarloaf trailhead in west Sedona. Several Forest Service vehicles are here and a makeshift table is going up in the parking lot. We’re volunteering to help make a new trail. Brian learned of this opportunity from a poster at a trailhead, a couple places in town also have them up. The poster said to bring work gloves, close-toed shoes, water and snacks, and the hardhats and trail tools are provided. But a local business provided coffee and pastries for breakfast and another is bringing pizza for lunch at the end of this particular event. Volunteers are separated into crews. There are hoes, hand saws, and loppers. I take a lopper having some experience with that from my time volunteering as a conservation camper for the University of Florida a couple years ago. We start out walking down Thunder Mountain trail, then duck through a line of tall bushes to get to the work site. The bushes will eventually need to be cut down, but that’ll be the last thing the trail crews do, once of the rest of the trail is complete. This keeps people from wandering down it before it’s finished. It’s a cool morning with heavy cloud cover. This is ideal for doing physical work outdoors. Our future trail has been blazed with white marks and yellow flags. The white paint indicates where the center of the trail will be, the yellow flags are the edges. We’re instructed to cut back brush and limbs an arm length from the center of the trail. We work our way down the trail, hopscotching over each other to get to the next area that needs attention. Those with saws work on juniper limbs, loppers get the tall brush, and hoes dig out the smaller plants. The clouds part later in the morning, less ideal for physical work but more ideal for photos. The prickly pear cactus are interesting to deal with. Their roots are shallow enough that even larger plants can be removed with a hoe. If only a few paddles need to be taken off, a lopper or a hoe can do it. Prickly pear have an interesting survival mechanism, paddles removed from the main plant can be set down on top of dirt and they will likely grow new roots. So we’re not really killing them so much as transplanting them. The trail is going to be great when it’s done. It goes right back to (and in places on top of) red rocks. I couldn’t ask for prettier scenery while working. We meet up with another crew that’s doing rock work in the one big wash that crosses the trail. They’re moving dirt and rock around to make steps leading down and back up from the wash and creating a solid bottom in the wash that won’t get muddy when it rains. Towards the end of our three-hour detail, I end up with a saw. Our handler explains that there’s an art to cutting tree limbs. You want to cut close to the trunk to avoid leaving unsightly stems behind, and on the larger limbs you want to undercut a bit before cutting from the top, this keeps the bark from tearing down the tree. In practically no time at all, the word to finish up is given and we head back to the trailhead to turn in our gear and grab pizza. Brian and I both leave smiling, volunteering always puts me in a good mood. I’ve talked about it before and I’ll mention it again, we have a need not just to make our own lives better, but to help others as well. I make use of Forest Service land quite regularly and it’s very rewarding to be able to give back. A lot of people are going to enjoy this trail once it’s complete. Hopefully in a future year I’ll be able to come back to the area and hike it myself. If you’re going to be in the Sedona area, volunteer trail crews go out on the first and third Saturday of the month this time of year. You can contact the Red Rock Visitor Center and Ranger Station in Sedona at 928-203-2900 for more details. For general Forest Service volunteer opportunities, visit the Volunteer page of the Forest Service website. Gosh Becky. You will never in a million years guess where I took this picture from this morning. A SD plate for my trailer is now in the mail so Cottonwood is a good place to stay until it arrives. The trail maintenance brings back some good memories. Cool that you were able to do that. Cottonwood is great for hot air balloon viewing Kent! Yeah – when I pulled into my spot in the RV park, I thought who goes around screwing with wheel chocks but then I noticed my small awning partially wound up, so I guessed wind. Moving wheel chocks? Mine moved as well from winds here in Maryland a couple nights ago. Go figure? I found your site on youtube while looking for RV stories. Made even more interesting that you are in Sedona. I love Sedona! Thanks for the information concerning the volunteer opportunities. I’ll have to consider this next time I’m in town. I look forward to following your adventures! Welcome to IO Victor! Sedona is beautiful and I really enjoyed my time here. Moving north now, but it was a good couple of weeks for sure. I hope you continue to find IO entertaining and informational. Take care! Glad the white stuff didn’t find you. What a great way to spend a morning – wonderful photos. We forget how much work is involved in the initial clearing of a trail as we enjoy using them through a wild area. Thanks for your contribution!! Jodee Gravel recently posted..Sagebrush and Snow – in Los Angeles? Thanks Jodee and I’m glad the snow passed me by too, that wouldn’t have been much fun! What a wonderful idea. Our parks should do more spot volunteer works. Most people staying more than a week end would do it for a morning but getting the donated food might be a trick. Sherry recently posted..Wekiwa Springs State Park: Campground, Trails, Spring, Local Residents. Most parks do have volunteer programs Sherry (at least the ones I’ve worked and volunteered at), but getting the word out to visitors about volunteer opportunities can be hard, especially if visitors don’t bother looking at community boards and the like. As for the food and other donations, that’s entirely dependent on the community. Very interesting post. I didn’t know they would use volunteers for this or that they would be making many new trails. A related question. What resources do you use to find existing trails near where you are heading? Usually I stop in at the nearby visitor center and get a trail map Wayne. Sometimes my Google maps app shows trails as well.